Like any group whose first try ends in smashing success, the pressure is high for Voters Not Politicians to ensure it doesn’t become a one hit wonder. Its founders were a group of political novices who organized thousands of volunteers to change the state constitution over the wonkiest of subjects, gerrymandering. The group’s proposal to take the drawing of political boundaries away from partisan politicians passed with more than 60 percent of the vote in November. The improbable victory means a 13-member, multi-partisan commission of Michiganders will be responsible for drawing district lines. Now, the group is turning to its next battle: Find the next cause and spread the word about how the public can get involved with the new redistricting commission the state is constructing for future elections. 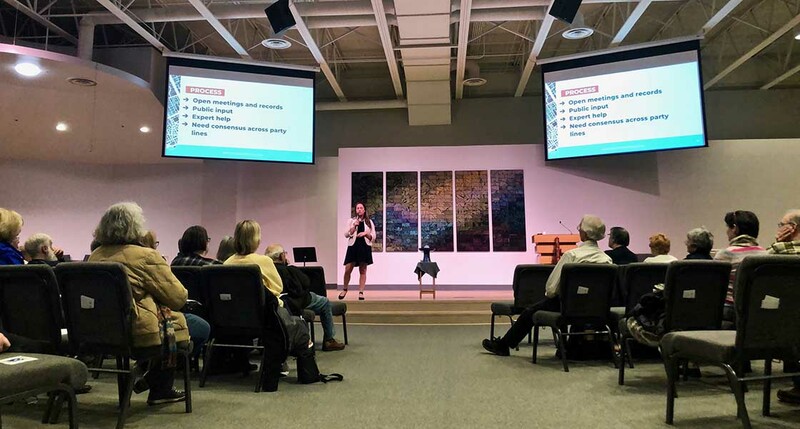 In keeping with its follow-what-voters-want ethos, VNP is brainstorming what issue to tackle next in the state through dozens of town halls its hosting from the Upper Peninsula to Southeast Michigan. The group must also demonstrate it can be effective without its founder and most public face, Katie Fahey, who is moving on to lead a national organizing initiative along with three VNP colleagues who followed Fahey to her new post. After the November election, many volunteers were itching to find a new cause to throw their political muscle behind. But VNP organizers and many other volunteers first wanted to ensure the anti-gerrymandering measure, Proposal 2, was implemented as intended. So after November VNP’s first move was to protect the integrity, as they saw it, of the new redistricting commission. “Our number one priority right now is making sure that the redistricting amendment is implemented fairly, impartially and transparently,” said communications director Amelia Quilon. The group opposed a Republican Senate-led lame duck bill this past December to define the political affiliation of commission applicants, which they argued was illegal because Proposal 2 was designed to be “self-executing.” The bill later died in House committee. VNP organizers also opposed lame duck legislation that placed a 15 percent cap on how many signatures citizen initiative groups can gather from each congressional district in the state, according to Fahey. The bill was signed into law in late December, but new Secretary of State Jocelyn Benson has asked Democratic Attorney General Dana Nessel to review the constitutionality of the law. Nessel’s response remains pending. In the meantime, Voters Not Politicians has secured more funding from the Texas-based Action Now Initiative. (The group was VNP’s second-largest 2018 donor, giving more than $5 million, much of it in the final months of the campaign.) VNP would not say how much the Texas group contributed. Voters Not Politicians also launched a new round of town halls to rev up its volunteer army in early March. And the group bid farewell to Fahey, its founder, who is leaving to lead a national organization based on the VNP model, The People. Nancy Wang, former President of the group’s Board of Directors and a co-founder, will now fill Fahey’s role as executive director. Wang said people can expect continuity because both she and Fahey prioritize allowing volunteers to drive the group’s activism. Each town hall features an in-depth presentation about how the new redistricting commission will work and the timeline for its roll out. Commissioners will be selected by next fall. They’ll begin work immediately and finalize maps by November 2021. The first general election with the new maps will be November 2022. “We’re prepared, we anticipate it, we’re ready for it,” she said of legal battles. After updating volunteers on the commission, town hall attendees — including avid volunteers and people who have never heard of the group, said Quilon, depending on the location — open the floor to discussions about what’s next. One man said: “We have lots of opportunity to change the voting process with no-reason absentee (voting) and I think educating” the public about their new rights under Proposal 3 would be best. The first round of town halls will continue through April, said spokeswoman Elizabeth Battiste. VNP leaders said they can’t estimate when they’ll settle on their next issue. Watching the creation of the redistricting commission and encouraging public participation is still the group’s top priority. I have absolutely no idea whom Ms. Beggin is trying to kid here, but "political novices" don't just jet off to Hillary's election night victory party, nor do they "secure" donations from an organization that is curiously silent regarding whom they are, what they stand for, or even where THEY get their funding. For an entity like The Bridge, which claims to be non-partisan, to not take ANY interest whatsoever in "Following the money", certainly raises red flags. Much like those of the faux outrage over the alleged “self-executing.” nature of VNP's proposal that they claimed existed. Refresh my memory, EXACTLY how did VNP propose to address that issue again? How does one accurately determine someone's political affiliations? And what did they intend to do when those affiliations are discovered after they have deceived the SoS? I fail to recall VNP, nor The Bridge, reporting on that troubling detail. Will scofflaws face jail time? With the VNP's Redistricting Commissions reputation in ruins, will the revised district boundaries be thrown out? What will happen to those politicians elected during that time? Will any legislation introduced by them be discarded? Will all of their votes made on the Chamber Floor be nullified? Will their elections be nullified and new elections called? These questions are only the beginning. This parade of horribles is typical of the type of disinformation that supporters of the rotten status quo tried to foist on Michigan voters last fall. A couple of things should be noted. FIrst of all, other states have already established independent redistricting commissions to draw state and congressional legislative districts. None of the "possibilities" laid out has happened in any of these states. Second, many of these arguments were raised in 2018. They were rebuffed by the facts, rejected by the Michigan Court of Appeals and the Michigan Supreme Court, and rejected by the voters. Like those who want to repeal Obama care, the author's concerns are belied by his failure to defend the current corrupt process of redistricting as well as his failure to present an alternative proposal that might be better than the commission that Michigan voters emphatically approved last fall. Finally, there is no reason to attribute anything other than unholy motives to anything passed or even considered during the lame duck session after last November's election. So quick to assign ulterior motives to my position, while ignoring the fact that your "solutions" don't work. This is an interesting (albeit unoriginal) response, zooman. Care to provide some actual examples of how the courts actually answered those questions? The "well, it didn't happen anywhere else, so it won't happen here" argument side-steps my points above. Either your reading comprehension leaves to be desired or your memory. I NEVER defended the status quo. I did state that putting democrats in power would be disastrous for Michigan given their easily verifiable record of running states that they control like Illinois and California into a collision course with fiscal disaster, exactly like what happened to cities like Detroit & Flint (also under democrat party control). An out-state questionably funded organization that proposed solving the problem of gerrymandering, by utilizing another form of gerrymandering to remedy gerrymandering isn't a solution at all. Did you even bother to read the links I had included above? And if you also bothered to read VNP's con job that they pulled on Michigan Voters last year, any solutions that I would propose (i.e. abolishment of all party labels and iconography on ballots & also within the Michigan Legislature and associated bureaucracies, imposition of a Part-Time Legislature whose session ends and the end of June), half of those cannot be implemented because of VNP's actions last November. Have no fear, current politicians won't be removed from office at this time. They'll be voted out next election. Maybe independent people will get a shot at deciding the future by correcting some of the deceptions of the past. We can only hope for a little clarity, a little sunshine in Lansing will not lead to an overdose of vitamin D.
Any initiative to increase transparency in government would get my vote. What does "find the next cause" mean. Does it mean find something that benefits Democrats? Will any cause VNP takes up be non-partisan? I really don't know how they will "make every vote count". In every instance, there are two or more candidates or sides to a question. If I vote "A" and "B" wins, then my vote didn't count? The only way a vote can not count is if somehow the system is hijacked and vote totals are altered before they go forward. I think Michigan is pretty secure in that there is a paper trail to back up the electronic counting of the votes. Other causes is most likely something that is needed fir the people not just fir the rich or corporations. How about a living wsge. Child care that is affordable. Better education. Healthcsare etc. In the interests of transparency, this group needs to change its name to “Voters plus Texas $$$, not Politicians”. It boggles my mind how we can be upset about Russia trying to influence our National elections, but it’s alright for Out-of-State influencers to impact what happens in our own State of Michigan. Also, over the years I’ve witnessed many groups come together over a particular issue, and once resolved they don’t know how to go away. There must be some interesting behavioral analysis of why such groups feel the need to continue on. You should take a look at 5G technology and how it is being forced on the public even though it is opposed by many scientific and professional people. The Edge of Wonder web site is a good place to start you considering if this 5G is a good idea. I am tired of all this technology being forced upon us without testing and without our consent. I do not want 5G technology, but it appears I am going to be forced to live with it and the the electromagnetic smog it will produce. Giving Voters more rights.........um, no.........Our Declaration of Independence recognized our God Given Rights. The rights our state legislature and power hungry partisans abuse for gain. I would like to suggest work towards a National Popular Vote bill and send our Electoral votes to the candidate that wins the majority of votes in all 50 states and the District of Columbia .